Last month when I first became vegan I mostly ate fresh veg with bread, potatoes or rice, apart from snacks. 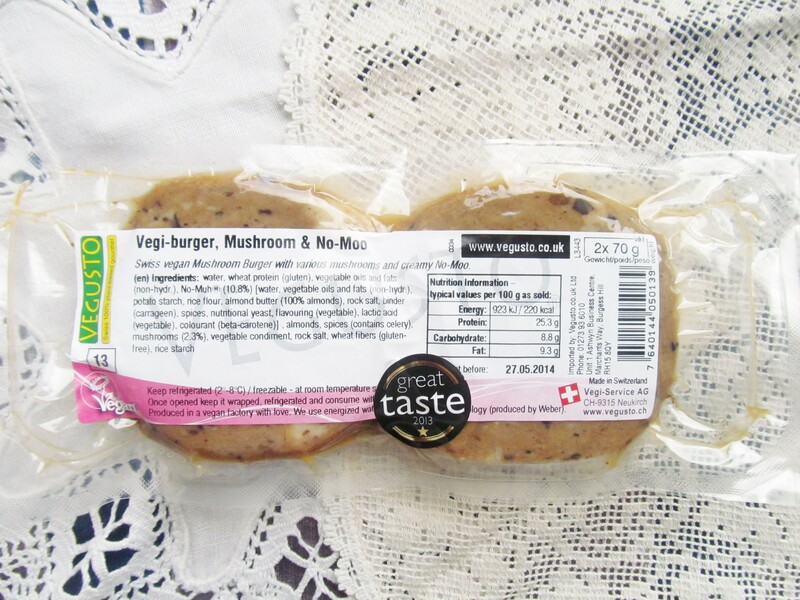 This month I’ve been experimenting with vegan dairy and meat substitutes! 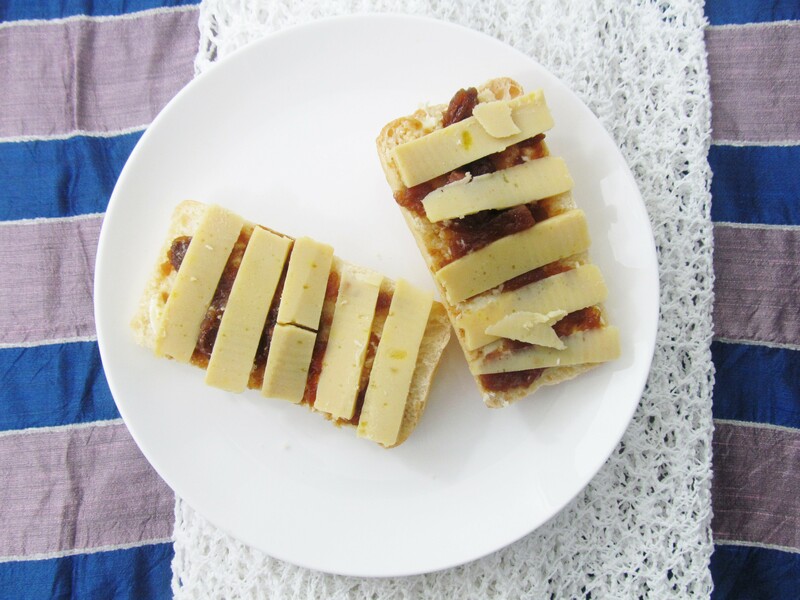 Vegusto are a fairly new company well-known for their vegan cheese although they also do snacks, drinks, vitamins, pet foods and meat substitutes. I was so excited when they sent me a goodie bag full of food to review since I was on the hunt for a good vegan cheese! The first thing I tried was this Mushroom and Cheese burger. I fried it for a couple of minutes and ate it with tomatoes, extra cheese and chilli sauce! 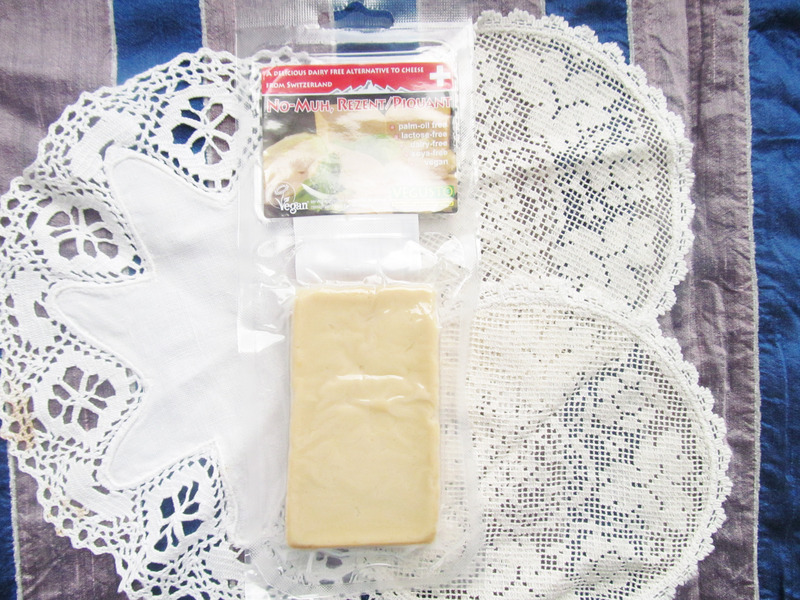 I was pleasantly surprised – it was thicker and firmer than I thought it would be and it was very mushroomy! 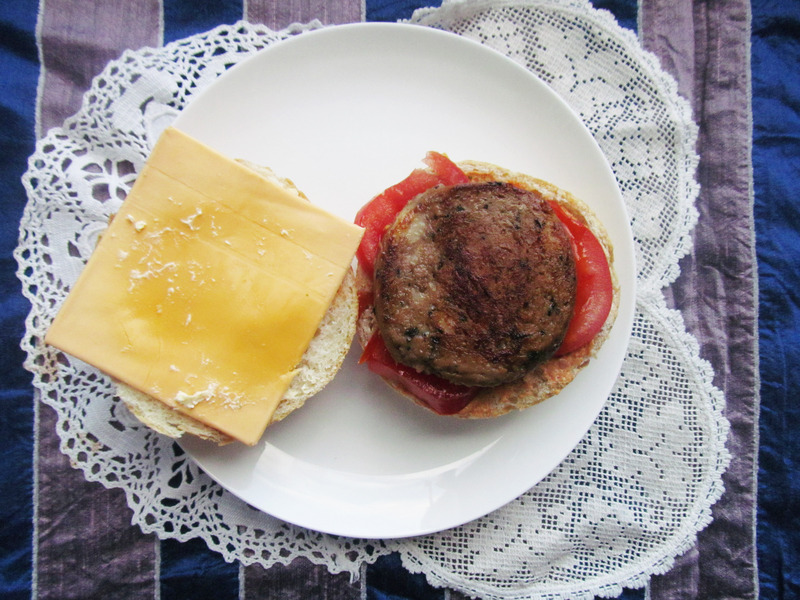 To compare, it was similar to a Quorn beef burger (which are not vegan), but with more flavour! 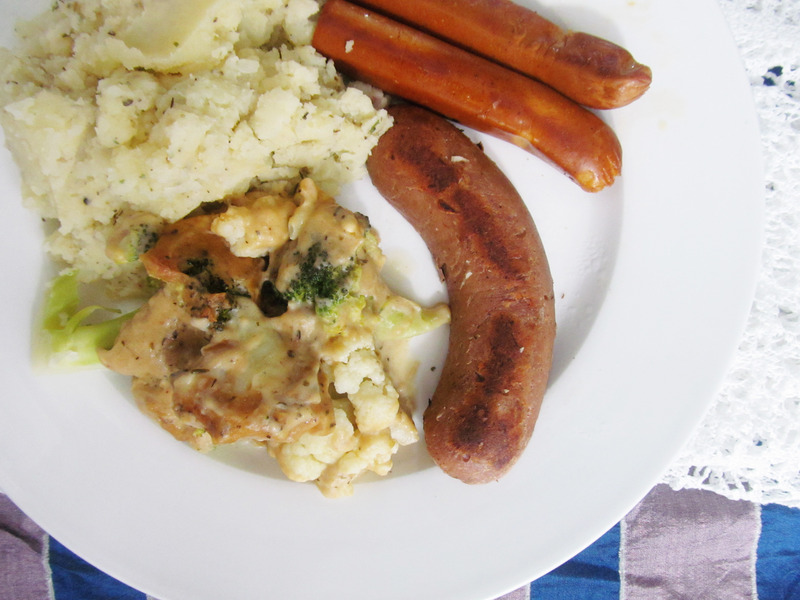 I fried the Farmhouse Style Sausage for a couple of minutes and ate it with mash, gravy and cauliflower cheese. Similar to the burger, the sausage had a firm meaty texture. It also had a strong smoky flavour which I wasn’t so keen on, but James loved it! 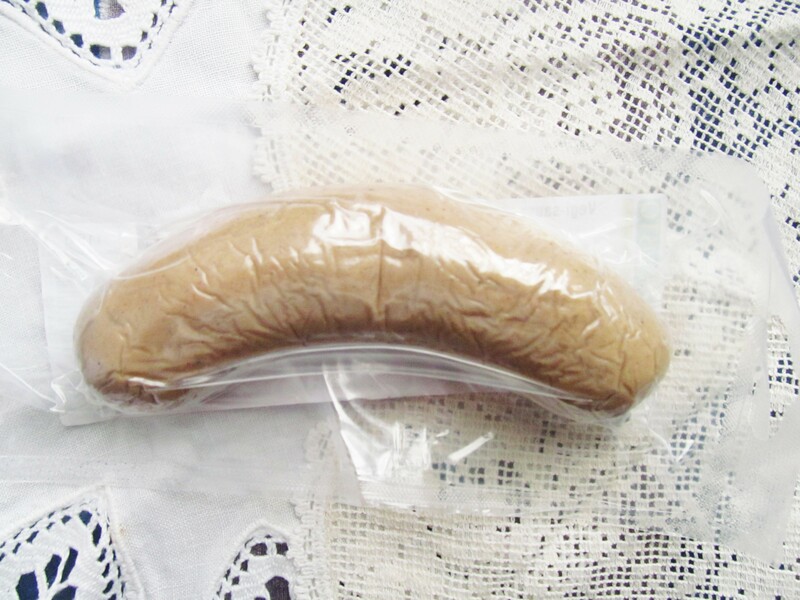 It’s definitely the chunkiest Vegan Sausage I’ve come across. 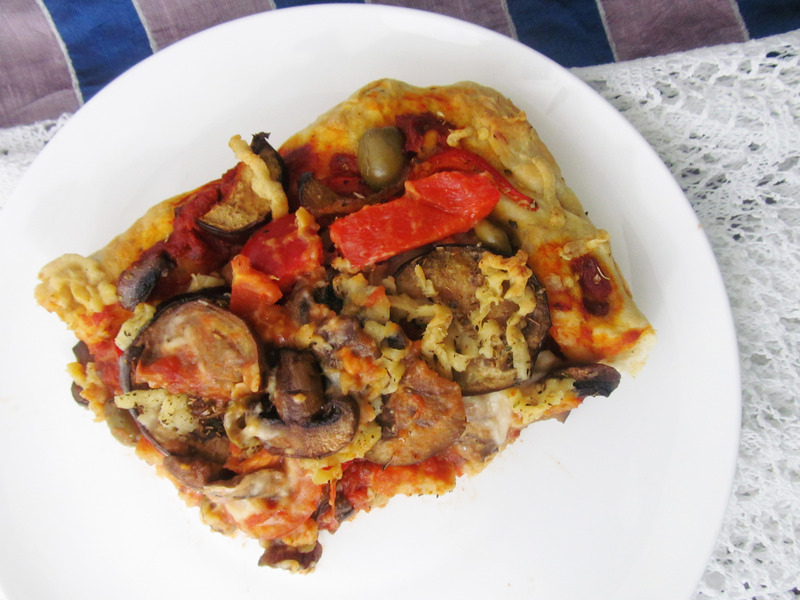 We used the No Moo Melty Cheese to make an enormous vegan pizza! 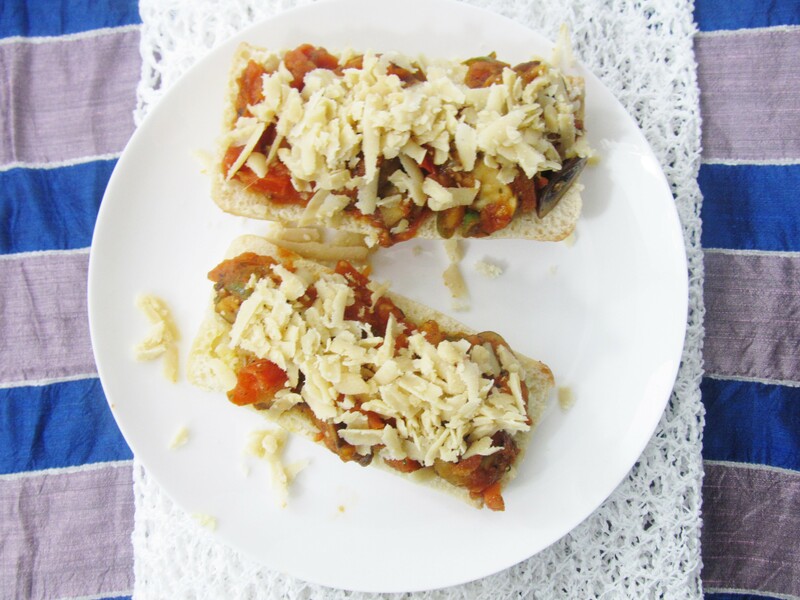 This is my favourite meal that I created using Vegusto products. I grated one half of the cheese under the veg and the other half on top. The cheese wasn’t as melty as I thought it would be, but that might be because we put it under the grill. 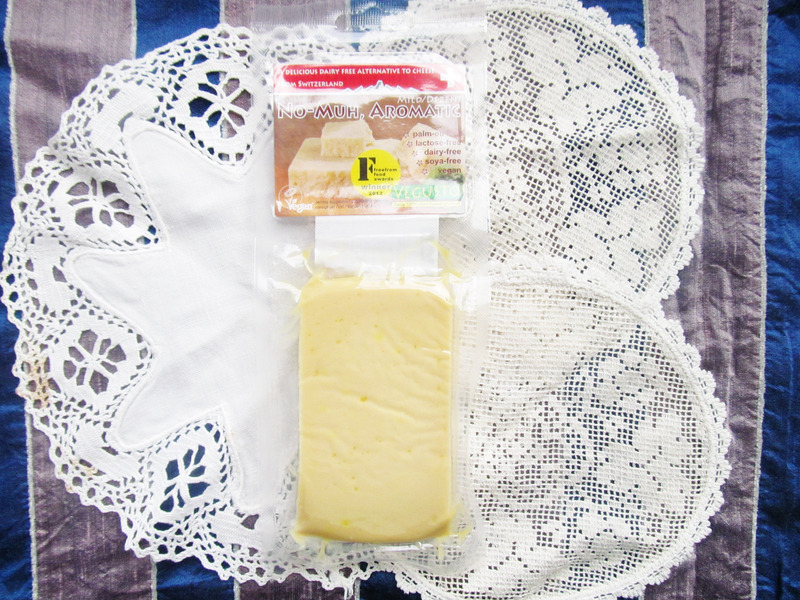 This cheese has a very mild flavour and is the most similar to other vegan cheeses that I’ve tried – it was lovely on the pizza and would be nice in lasagne and moussakka but it’s not similar enough to cheese for me to eat it by itself. Although, James said he would buy this again. 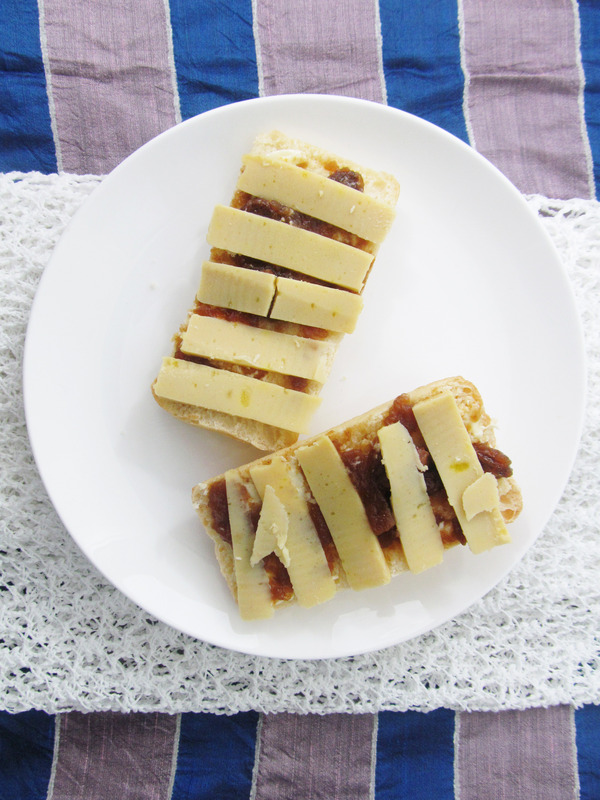 The two Vegusto hard cheeses are hands down the nicest vegan cheeses I’ve ever tried. I swear you wouldn’t know that it isn’t real cheese! This No-Muh Aromatic cheese tastes like a medium cheddar and I ate it with apple chutney on a panini. 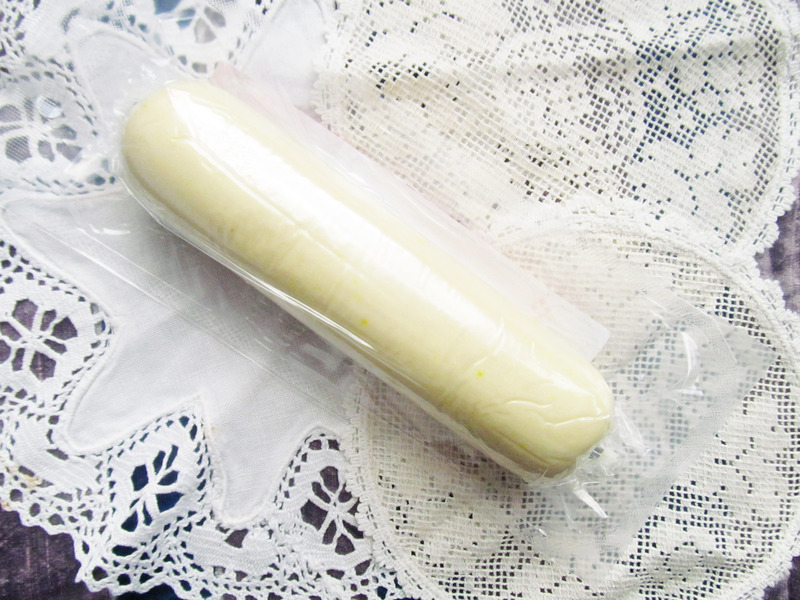 I would eat this cheese by itself straight from the fridge, or on crackers! It cut like real cheese and it was crumbly like cheddar too, with a tangy flavour. The No-Muh Piquant was also lovely. This cheese is my favourite! I ate it on top of a panini and grilled veg, and it is most similar to a mild parmesan. It’s more crumbly and has a stronger flavour than the No-Muh Aromatic but I would also eat this cheese straight from the fridge. 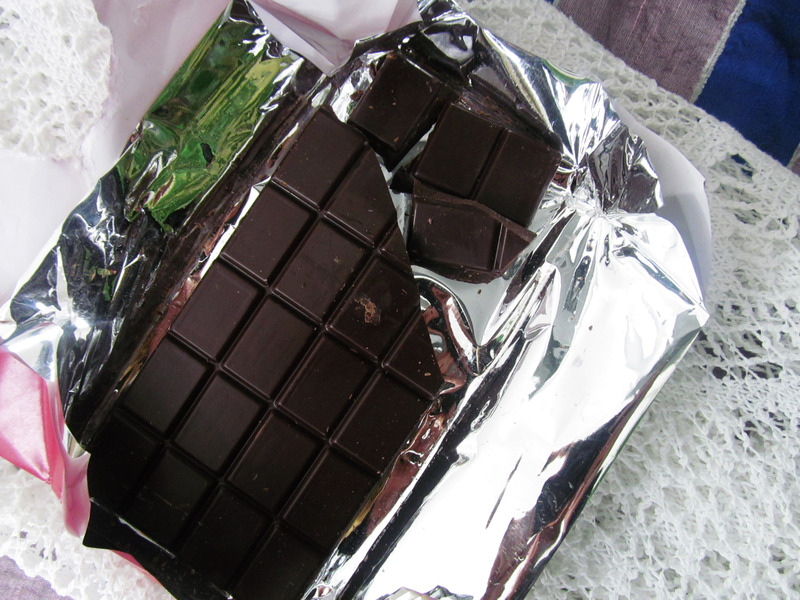 Did you know that most dark chocolate is vegan? Now you do! This coconut and raspberry dark chocolate is no exception, and I enjoyed this with a cup of tea and an episode of Buffy The sweetness of the raspberry really cut through the bitterness of the chocolate and the coconut was a nice crunch, although the coconut flavour didn’t stand out. Don’t forget that you could win all of these Vegusto goodies and more by entering my giveaway! 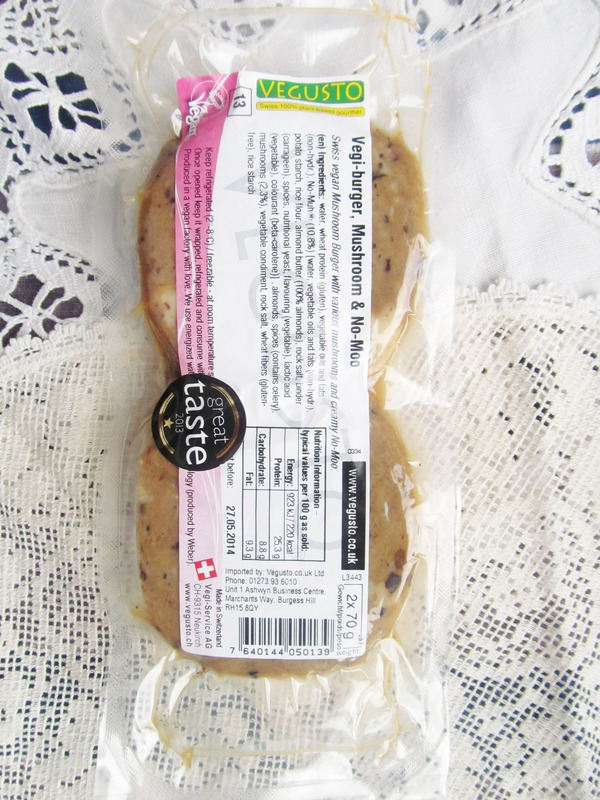 Have you tried any vegan meat, cheese or chocolate products? Mmmmmmmmmmmm that sausage was tasty. Nice review! You do a good job with giving a balanced opinion! I mainly eat vegetarian and occasionally vegan food but I also eat meat every now and then. I’ve never liked milk or seafood. I use Quorn (not vegan) and soya meat but I’ve also tried wheat protein products so I can imagine the sausage being tasty! I’m definitely intrigued by No-Moo Piquant. All the vegan cheeses I’ve tried are pretty poor substitutes but I’m a massive cheese fiend. I’m a big Quorn fan, it’s such a shame it’s not vegan! Yes, I love Green and Black’s and Divine. They had a fairtrade section in the shop at uni, so Divine chocolate got me through a lot of essays! I know! My brother was a vegan for many years and he was really annoyed that he couldn’t eat Quorn. Of course being Swedish, I love their Swedish style meatballs. Yay! They’re both great but I think I like Divine a tiny bit more than Green & Black’s. 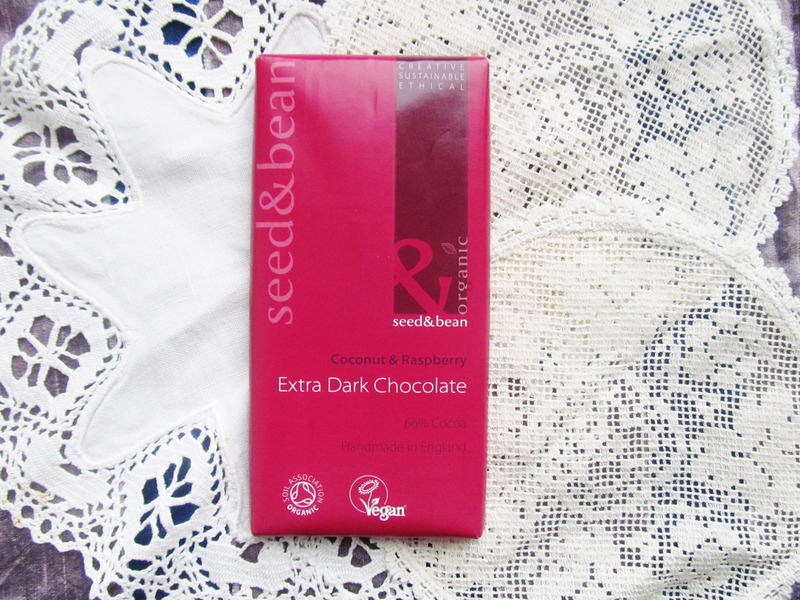 The combo of coconut, raspberry and dark chocolate sounds delicious! I liked reading your review. When I was a kid, they had meat free products by Linda McCartney at our local supermarket. One day they where gone, but I remember they were very taste. I don’t remember if they where vegan or vegetarian. Now I need my lunch!